The following article originally appeared in the Profiles of American Pipes Makers series in the May 1995 issue of The Pipe Collector, the official newsletter of the American Society of Pipe Collectors (NASPC), and is used by permission. It's a great organization--consider joining. Steve Weiner, Ohio pipe maker lives in Olmstead Falls, Ohio (a suburb of Cleveland), with his wife, Bonnie. Their Daughter graduated from Ohio University a year ago. Steve is president of his own utility bill consulting business, which performs electric, gas, and local telephone billing audits and verifications for such cliens as businesses and schools. He carves pipes in his basement workshop in the time remaining. After smoking cigarettes for many years, Steve decided to experiment with pipes in 1979, mostly, as he says, "out of curiosity. Pipe smoking quickly turned into pipe collecting, and I was hooked on the hobby." Then, in 1989, Steve's 89 year-old grandfather, a pattern maker by trade, died and left Steve the contents of his workshop: a drill press, two motors, had files and countless drill bits and other odds and ends. Steve had previously toyed with the idea of crafting a pipe, but this legacy helped him make uip his mind. He built a workbench, set up a shop and began producing pipes-- "or at least what I called pipes. They certainly didn't look like the Ascorti, Jacapo and Butera pipes I had been smoking, but I dept at it, and after a while they started to look like something." In the summer of 1990, Steve got a "real break"--a visit with Mike Butera in his Houston shop. As Steve says, "During one long Saturday, I learned more about pipe making than I had in the entire previous year. When I got back home, I applied what I learned from Mike and, with some practice, began getting results that actually surprised me." Steve attended his first PCCA show as a pipe maker in 1991. He was honored as best pipe maker at the 1991 and 1994 C.O.R.P.S. shows in Richmond, VA and received an award of merit at the 1993 PCCA show in Washington, D.C. When I asked Steve what ideal, in terms of craftsmanship and smoking qualities, he strives for, he answered that, in his opinion, "the best pipes being made today are those by Mike Butera. This is the standard to which I compare my pipes. I have yet to meet it, but I will keep trying." I remark to Steve that, as with every craftsman/artist, time must occur when he rises above the workmanlike job of producing a good, aesthetically pleasing product of which he can be proud and becomes inspired. What, I asked, causes such moments of inspirations? "Luck," he replied, "What inspires me is an exceptionally nice piece of wood. When I come across a nicely grained, flawless piece of wood, I tend to increase my effort to make the perfect pipe." Steve doesn't have one favorite tobacco but enjoys latakia blends and is currently smoking a matured Virginia from John B. Hayes called Tom's Red & Black. Steve Weiner makes his pipes from plateau briar and Italian lucite stems. The dot he puts in the stem is also briar, and his stem inlays are briar or lucite. he stamps each pipe with his name and "U.S.A.," and he numbers and dates each one. 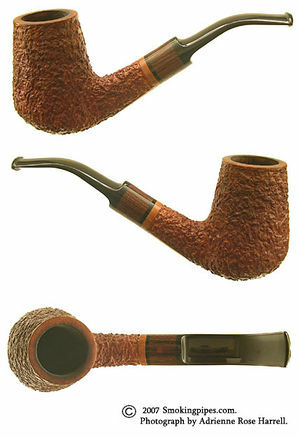 For example, the pipe stamped "00594" is the fifth pipe he finished in 1994. Steve subjects his pipes to a two-step treatment process, the first to remove any excess resin from the wood and the second to coat the inside of the bowl with his special carbonizing formula to ease the break-in process and protect the wood. Steve hand shapes every pipe, using sanding disks, hand files and sandpaper. He turns the tenons on a small lathe and then buffs them for an exact fit. He hand sands his smooth pipes to 320 grit and then buffs, stains and waxes them. He hand carves his rough-finished pipes. He tapers his tobacco holes but not so severely that a tamper will not fit into the bottom of the bowl. His air holes are relatively large to make for an easy draw. He constructs each pipe so that you can slide a pipe cleaner all the way to the bottom of the bowl without removing the stem. He slightly rounds the lip so it is not uncomfortable to the tongue. Steve's production varies with the time he can spend on his craft. For 1993 and 1994, he averaged 116 pipes. He has no philosophical objections to sandblasted pipes, but, because of space and expense considerations, he has not invested in sandblasting equipment. Therefore, when a briar block will not yield a smooth piece, he carves it. 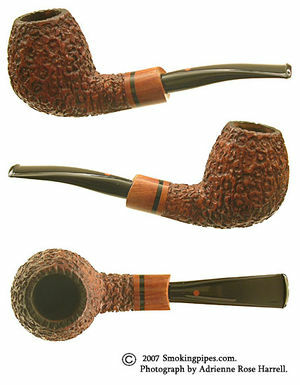 About 80% of his pipes are carved, and virtually all of his pipes are standard shapes or variations thereof. His retail pries start at $140 for a basic carved piece but can go up to $400 to $500 for smooth pieces with exceptional size and grain. Steve sells many of his pipes through Barclay Pipe & Tobacco in Columbus, but he has also placed pipes in shops in Akron, Chagrin Falls, Cleveland and San Francisco and in Virgina and North and South Carolina. This page was last edited on 23 November 2010, at 17:59.